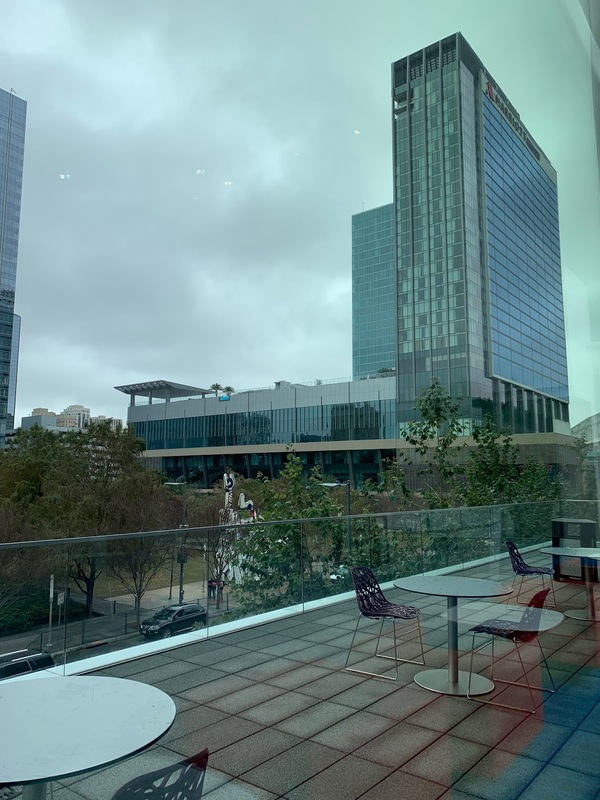 View of the hotel from the convention center. We stayed at a different hotel this year - the Marriott Marquis, which is a little over two years old. It's right across from the George R. Brown convention center, where the expo is held and also where the finisher area is, so it's super convenient. It was really nice - the lobby was light and open and the rooms were quite large; beds and bedding were comfortable, and they had a BaByliss hair dryer in the bathroom and now I want one. Apparently there IS a difference between my cheapo Conair and the Babyliss - who knew? 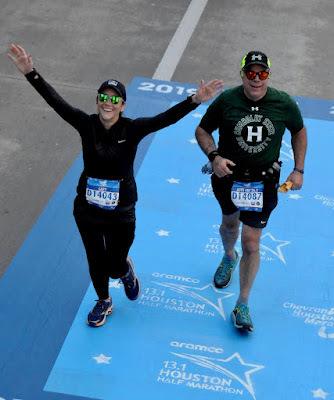 Of course, all of that niceness comes with a price; we got a special rate by booking through the race website but with taxes and the parking fee, we paid $302 - yikes! This was also why we only stayed one night; while we were prepared for the expenses of this weekend, we are not moneybags, so that was it for us. Now this is one awesome lazy river! Unfortunately, it was freezing cold the weekend we were there, which was great for the runners but not great for going in the pool. Jeff ventured down and laid in a cabana for about an hour on Saturday afternoon but the winds were gusting over 25 mph and he couldn't take the cold so he came back inside. Running under one of the photo ops on the course. This was in the last mile of the race - there was a series of these shots and it was cool because Jeff and Cary were in sync with their steps. Finish line! It's hard to get a decent shot at the finish line of big races because usually there are a lot of other runners in the picture. Cary, Jeff, and Brian. 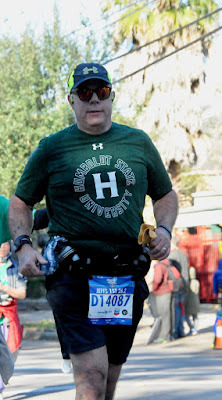 The clock finish time is from when the race began at 7:01 am; their finish time was 5:47 - the difference is how long it took their corral to cross the start line. Great shot right after they'd been medaled! 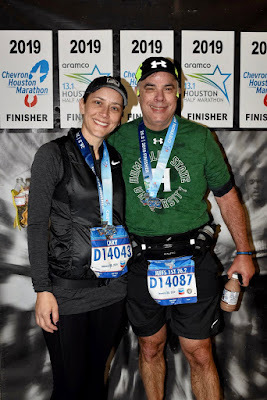 Cary and Jeff - FIRST TIME MARATHONERS! When you work so hard for so long for this, the medal deserves a place in the spotlight! 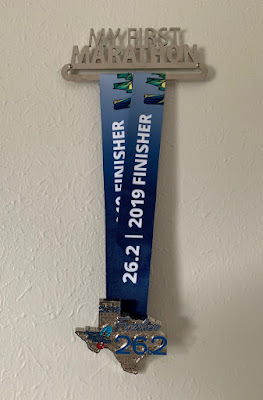 Now I just need to print up some of the marathon pictures to hang next to the medal and his WALL OF ACHIEVEMENT will look really sweet. 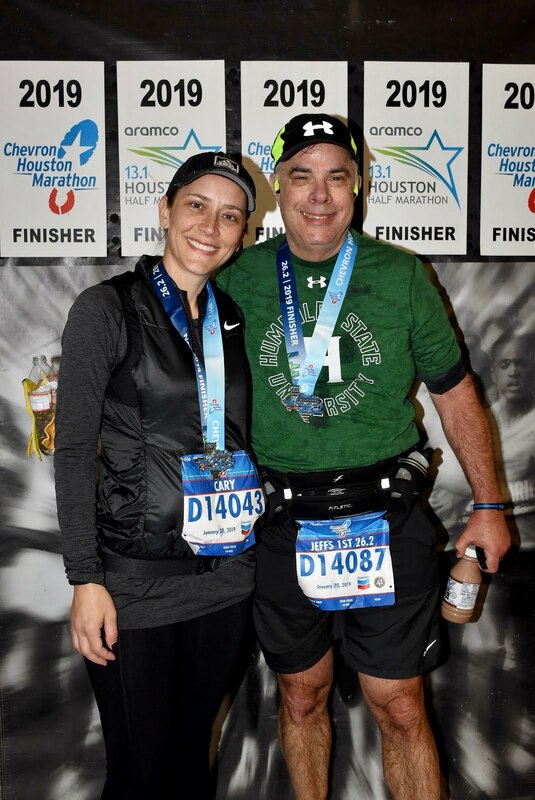 ...and that's a wrap on Houston! Awww, love that marathon medal holder! What a great idea! That hotel sounds great. I actually don't mind splurging on nice accommodations. Love the present you bought for him!! Looks great!!! And yes, that is one heck of a neat lazy river!!! Jeff should have hit the lazy river immediately after the race - it would have worked like an ice bath lol. People always say running is free which is true - unless you want the correct shoes, clothing, and to travel for races. Am I right? Great pictures! At first I was excited when you told about the Marriot. Because the Hilton is always full for the big quilt show. But yikes!! $300 per night? Too pricey for me! Although I do love that lazy river!!! Did Brian, Cary, and Jeff all finish at the same time? 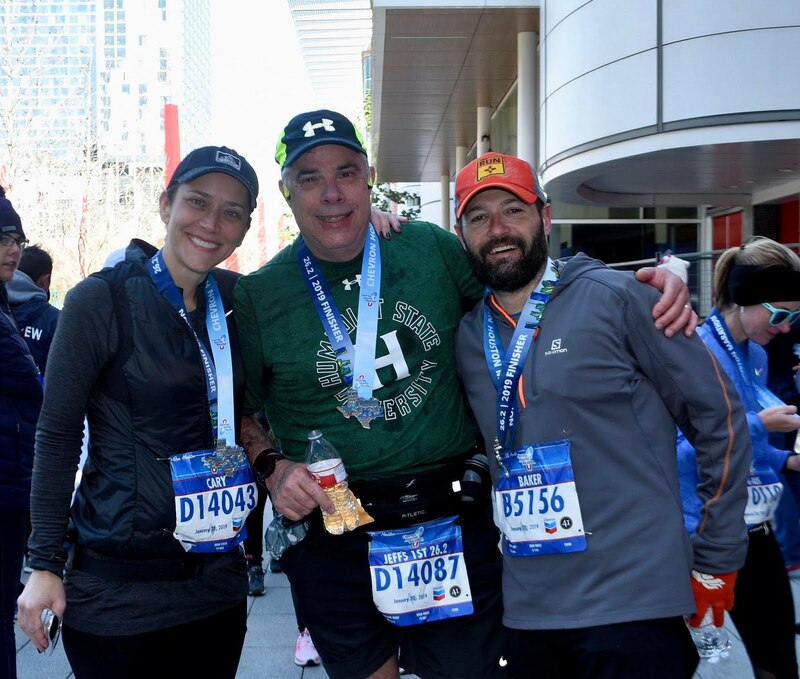 I love the picture of all three of them with their medals. Maybe the Marriott will have a better deal for the quilt show than for the marathon - it's really nice and I'd choose it over the Hilton, but yep...$$$. Yes, Jeff, Cary, and Brian all finished together. Julia was about 5 minutes behind them. Yay! The new medal holder is awesome!!! What a great gift! His photos turned out great! That is awesome they got him and Cary! 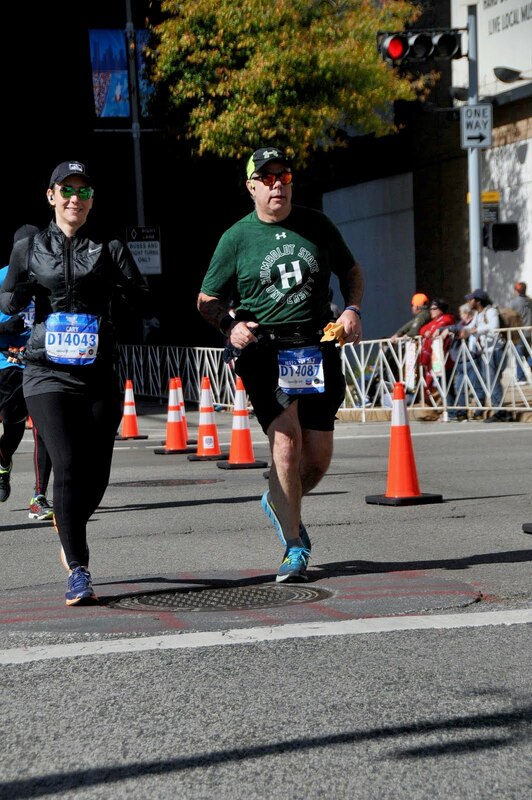 It's frustrating when you do a race with a friend and they are cut out of the pics. 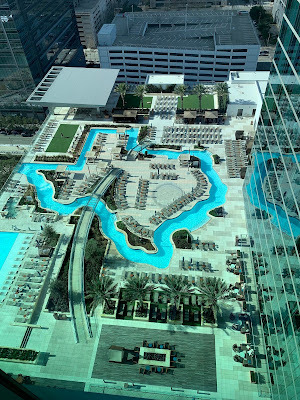 I remember reading about that Texas shaped lazy river. Too cool! Literally cool. Eek, I hope you get a chance to go back and enjoy it some day when it's not hella expensive! 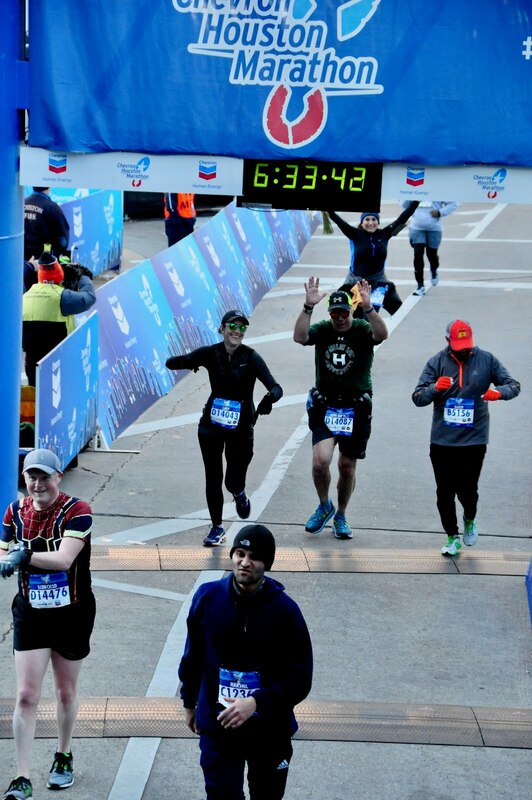 For real, I've run races with friends and have had them cut out of pictures - seriously?! That lazy river! I will definitely need to check that hotel out sometime! 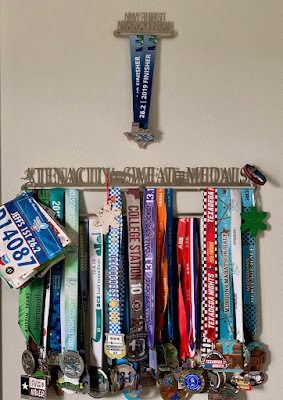 LOVE that medal hanger, too! Congrats, Jeff! !